I noticed on a bistrot's price board, this symbol was used to denote prices. It looks a little bit like an upside-down V, and the closest match shapecatcher.com could find was ⩘. It could also be compared to a segment of a sawtooth wave. It's the number one, with a left-hand stroke, and is not uncommon in European countries, including France. The numeral 1 — This numeral is sometimes written with a serif at the top extending downward and to the left. People in some parts of Europe extend this stroke nearly the whole distance to the baseline. It is sometimes written with horizontal serifs at the base; without them it can resemble the shape of the numeral 7, which has a near-vertical stroke without a crossbar, and a shorter horizontal top stroke. This numeral is often written as a plain vertical line without an ear at the top; this form is easily confused with the capital letter I and with the lower-case letter L.
It's just the number "one". It's not a French specificity, in continental Europe (and in most countries with (Continental) European influence) we (almost) never handwrite the number "1" as "I" like english-speaking people do. Also, we usually handwrite 7 with a middle bar so there is no mistaking possible. As you can see, most of the problems arise with 1, 4, 6, 7 and 9. The first column is how I personally write the numbers (German). Both 1 and 4 can have a underscore. 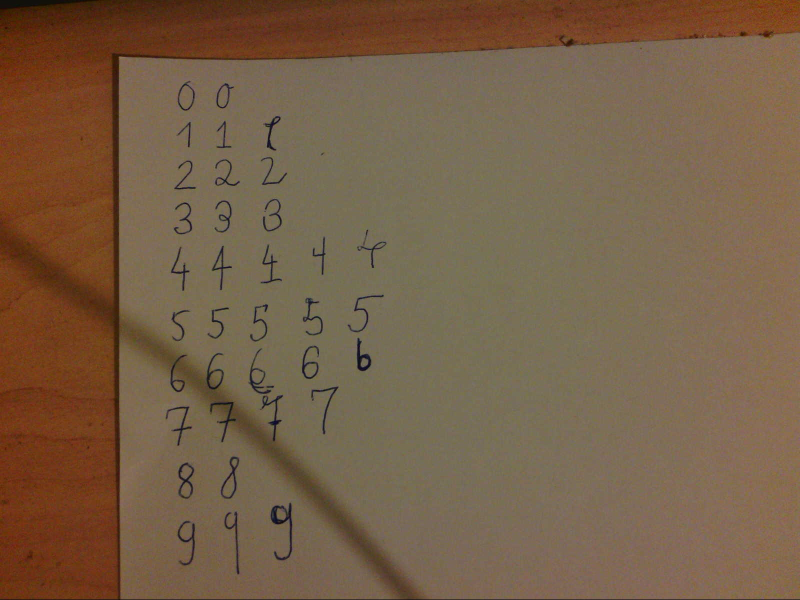 As you also see, some numbers like 1, 2 and 4 have sweeps if you write with pen. Both 6 and 9 can end vertically, with can cause the 6 look like b. 7 has always a horizontal bar. The third 9 has a vertical extension above on the right side of the circle, I hope it is prominent enough. If someone has also a notable variation, I can add it later to the paper. This PDF looks to me like standard French school-writing. So you're seeing a (quite well-formed) 1 -- the photograph in the question shows the ascender on the left (correctly) starting about half-way-up. ... which I find easy to recognise as a 1 (and a good argument for requiring a cross-bar on the 7, to disambiguate it). I don't know what character you used to represent that in type, i.e. "⩘" ... I didnt recognise that as a 1 because the ascender starts at the bottom of the line. Not the answer you're looking for? Browse other questions tagged europe money price french-language or ask your own question. Are there more mixed nudist baths like Friedrichsbad in Baden Baden in Europe?